There is one storm system standing between us and Christmas. It's a very familiar story too — just like last week, this storm system will drag rich moisture and warmer air into New Jersey. So once again, we're talking about an extended period of wet weather, and not really anything wintry. Bottom line for travelers... Especially if you're flying anywhere for the Christmas holiday... Thursday night into Friday, periods of heavy rain and occasional thunder/lightning are possible. Saturday looks quite windy too, so flight delays and cancellations may continue. This Wednesday morning is starting off Cold, with a capital C. Luckily, Tuesday's ferocious winds (which made my garbage can disappear) have calmed, so we don't have to talk about a bitter wind chill. Temperatures range from the teens to the northwest, 20s for the vast majority of the state, and a few 30s right at the beach. The day will begin with bright sunshine, before some fair-weather clouds build Wednesday afternoon. High temperatures will be seasonable — in other words, typical and par-for-the-course for mid-December — in the lower to mid 40s. Yes, you'll need a jacket all day. But with dry weather, only a light breeze, and near-normal temps, I think it's fair to call it a pleasant day. Wednesday night will be chilly, but not as cold as the previous overnight. Look for low temperatures in the upper 20s (interior NJ) to mid 30s (coast). Skies will remain mostly clear and dry. Thursday will start off fine. Skies will progress from partly sunny to mostly cloudy. Our next storm system will start to push into the state later on — first showers will drift into South Jersey Thursday afternoon. For most of the state, I suspect we'll stay dry until after sunset Thursday. And then we get soaked from Thursday night to Friday. 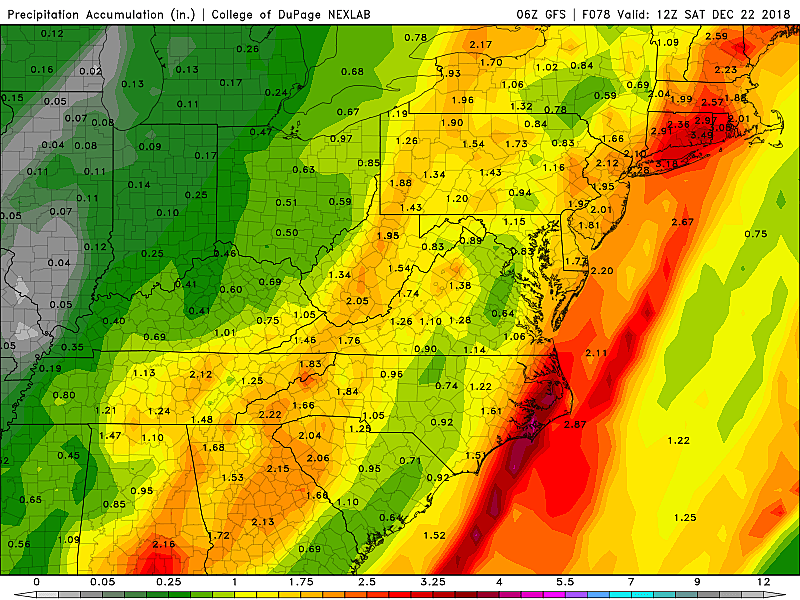 Rainfall estimates have actually gone up in recent model runs, as a rich plume of tropical moisture touches New Jersey. So let's call it a widespread 1 to 3 inches of rainfall across the state, with locally higher amounts possible. As our ground is still saturated after last week's heavy rain, it should come as no surprise there is a pretty high risk of ponding and flash flooding issues developing. A Flood Watch is already posted for most of New Jersey from 7 p.m. Thursday to 7 p.m. Friday. It looks like the heaviest rain will arrive in the Friday pre-dawn hours — dampening the roads just in time for the AM commute. I'm still not comfortable calling Friday a total washout — I think the rain will become more scattered by the afternoon and evening hours. High temperatures on Friday are expected to climb into the near-record lower 60s. (Maybe even mid 60s in South Jersey?) That's why we're confident this is a rainy forecast, and not a snowy one. Having said that, I still think that as our storm system departs and showers wrap-up Saturday morning, there could be some snowflakes. Best chance, usual suspect: the higher elevations of NW NJ. Accumulation is unlikely, given the light nature of the precipitation and the wet, relatively warm ground. Behind the storm, gusty westerly winds will return for the start of the Christmas holiday weekend. As skies clear on Saturday, gusts to 40 mph are expected. (Hold onto your hats — and your Christmas decorations!) I'm thinking we'll still see lower 50s for most of the state on Saturday. Sunday will be cooler, mostly sunny, and still breezy. Highs descend to the (still above-normal) upper 40s. Monday is Christmas Eve and Tuesday is Christmas Day. Both look like quiet weather days, with partly sunny skies and seasonable high temps in the lower to mid 40s. Again, sorry kids, no White Christmas this year.